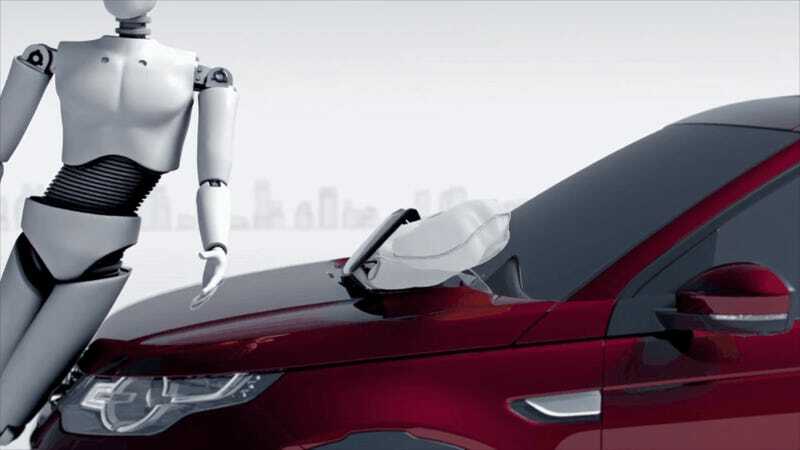 Good news for those of you who can't be bothered to take your eyes off your phone when driving through a mall, music festival, or [other crowded place cars don't belong]: the 2015 Land Rover Discovery Sport has a pedestrian airbag and autonomous braking to coddle distracted drivers. Activates within 60 milliseconds of the front bumper's pressure tube sensing a person, as long as the SUV's moving between 15 and 30 MPH. The air bag pops out right ahead of where the windshield meets the hood and keeps a low profile, so you can see out as you move on to your next victim. A stereo (depth-sensing) camera mounted near the Discovery's rear-view mirror keeps tabs on your closing speed with an object or car ahead, hitting the brakes if you don't. I can't imagine it's smart enough to compensate for road conditions or tire wear levels... still waiting to hear back from Land Rover on that.